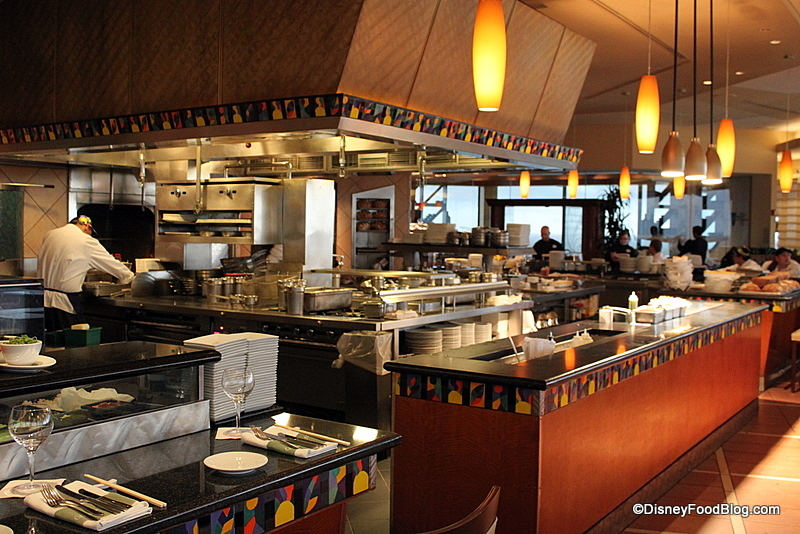 When planning meals for our October trip to Walt Disney World, I realized it had been a LONG time since we’d visited California Grill at Disney’s Contemporary Resort! And I haven’t reported on it here on the blog for over a year, so I figured it was time to get a little updating in! Let’s head over to the check-in desk, shall we…? 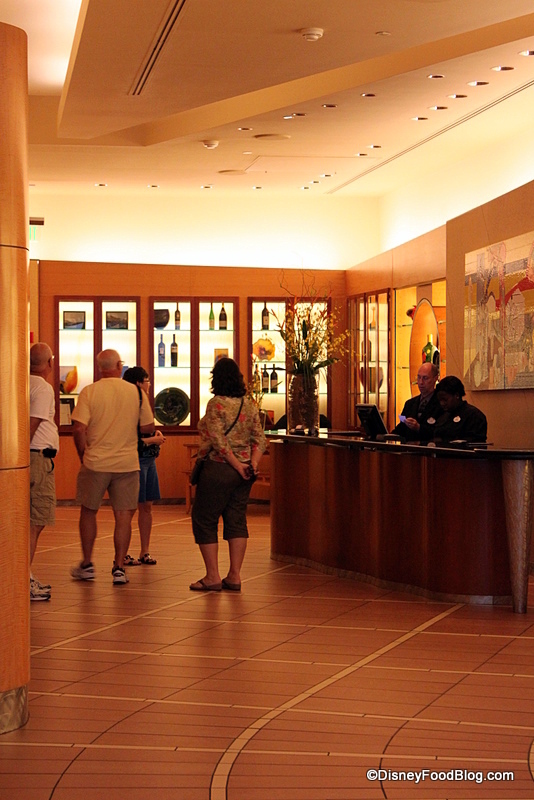 To access California Grill, guests need to head to the 2nd floor of the Contemporary Resort and visit the restaurant’s check-in desk (you can get here by elevator, or by taking the stairs/from the back of the lobby). 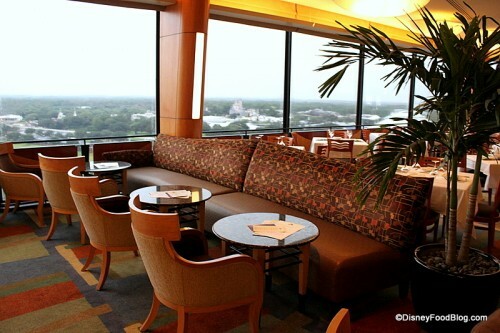 Once you’re checked in, you’ll be waved over to a special elevator — one used only for California Grill guests — and taken up to the restaurant itself on the 15th floor of the hotel! I’m always immediately impressed by the nearly 360-degree view of Walt Disney World. The gorgeous, sprawling Grand Floridian Resort in front of you; the spires of Cinderella Castle, Big Thunder mountain, and Space Mountain to your right; and the Wilderness Lodge and Epcot to your left will make it difficult for most folks to tear themselves away from the walls of windows to take a look at the menu! When you walk in, you’ll be greeted at the podium and (likely) handed a pager. No worries; there’s lots to do while you’re waiting. 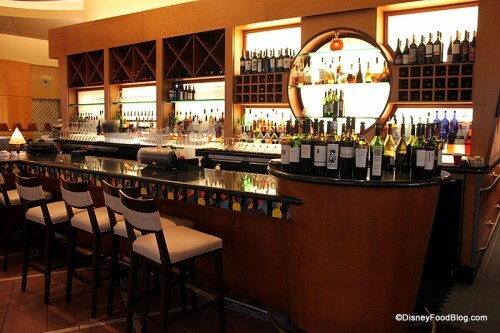 Start walking toward the windows and you’ll pass the California Grill Bar and head into the lounge area. Here’s a tip! If you don’t have a reservation at the restaurant, you can still get the menu offerings in the lounge, which has first-come, first-served seating. You likely won’t get a spot here during the Magic Kingdom fireworks, but you could definitely snag a table when the restaurant first opens around 5pm. This is a great “no reservations” option for some seriously high-quality food. 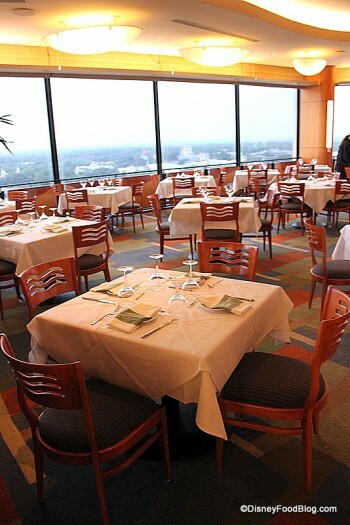 Speaking of seating, here are a few of your options throughout the restaurant. All of the decor features modern touches, light wood furniture, and sleek decor. We always request a table by the window so that we have that gorgeous view throughout our meal. This is also a boon when the Magic Kingdom fireworks begin — you’ll have the best view in the house! Remember, reservations are hard to come by during the fireworks (usually these take place at around 9pm, but check the DisneyWorld.com calendars before you book to be certain), so be sure to book 180 days ahead of your visit to be sure you’ll be one of the lucky ones! 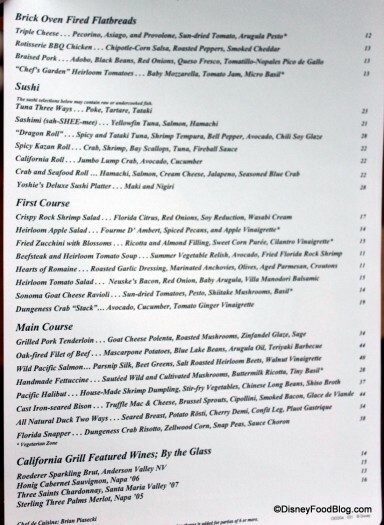 And the restaurant is known as one of the best places in Walt Disney World to get sushi as well. 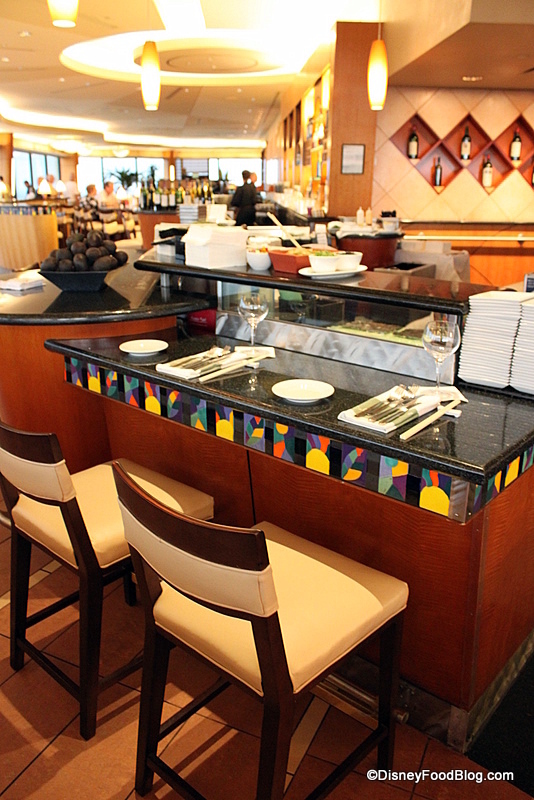 You can request a seat at the sushi bar if you prefer. 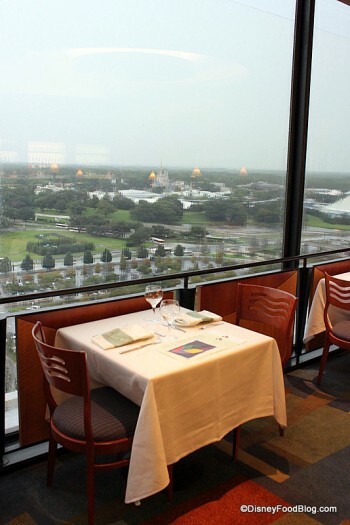 Don’t forget that you’re able to head out onto the outdoor decks at California Grill to check out the view or watch the fireworks. And should your reservation be for earlier in the evening, you can simply bring your receipt back to the restaurant at fireworks time to be authorized to head out onto the deck and see the show! 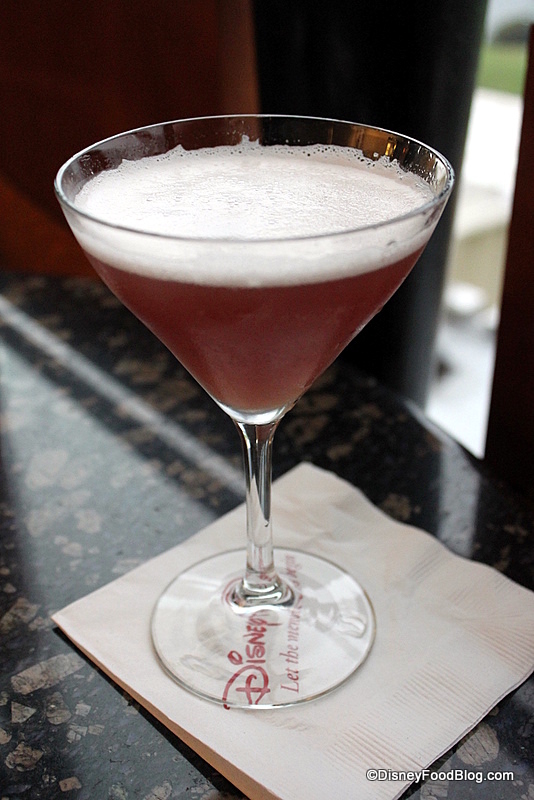 Before we were seated, I decided to start off with one of California Grill’s signature drinks. 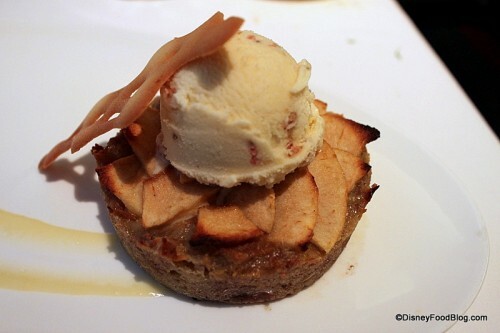 Luckily, this is one of the few restaurants that still serves a menu of exclusive recipes! 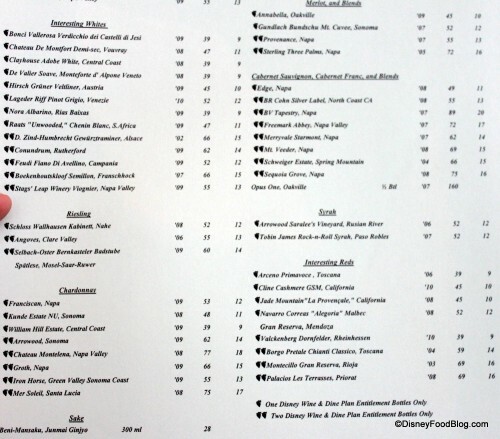 And the wine list is extensive as well! I began the evening with a French Martini, which was a bit more sweet than sour, unfortunately (in my book). I’m usually not a martini fan, either, so I’ll likely not get this one again. Once we were seated, it was time to dive into the eats! California Grill’s menu changes seasonally, so don’t be surprised if what you loved on your last visit is no longer available. That said, I can almost guarantee that you’ll find something new to fill that best-loved spot on your list! In addition to the cheese, we also started with one of California Grill’s famous flatbreads. 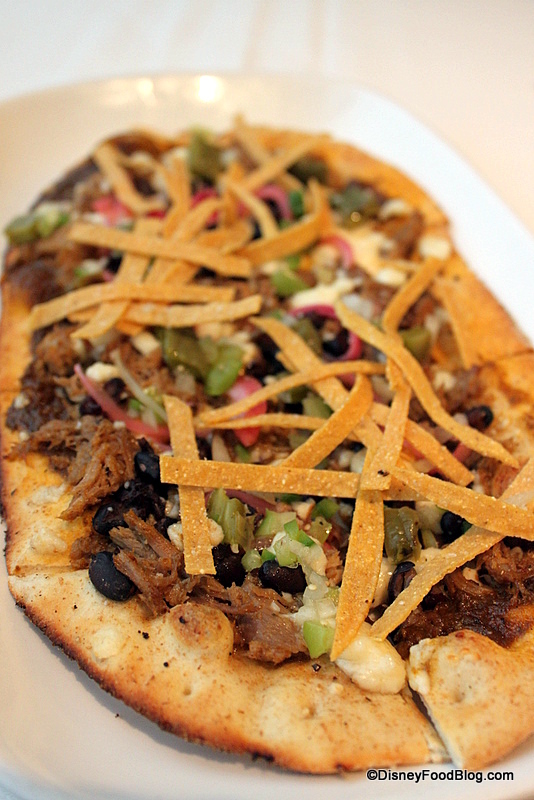 These change seasonally as well, and we were interested to see this Braised Pork Flatbread on the menu. I wanted to skip it and try the three cheese flatbread, but my husband won the coin toss and we got this one instead. Oh my gracious was this delicious!! I think it took about 10 seconds for us to gobble this thing up — and don’t forget we were stuffing ourselves with bread and cheese as well! 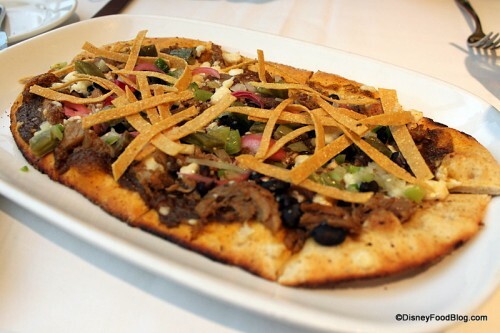 This was an amazing, savory mix of flavorful pork, queso fresco, black beans, red onions, and other gorgeous ingredients that came together to create one to-die-for appetizer. Order this one if you can! 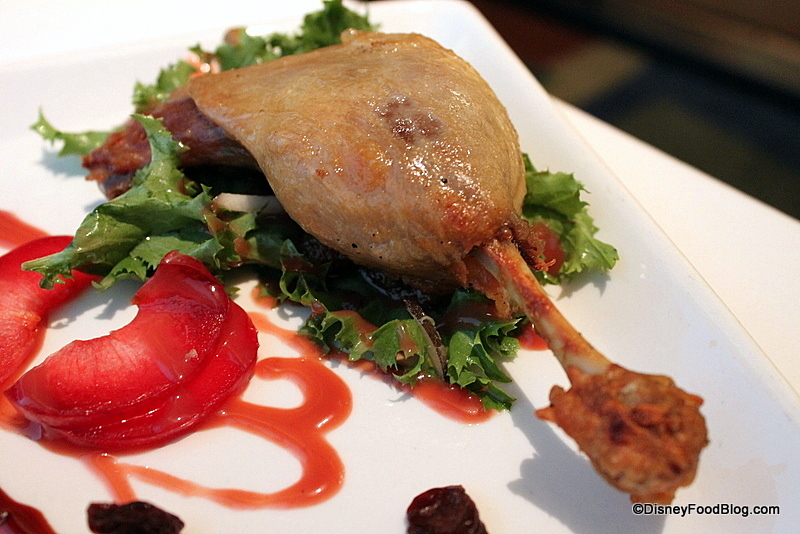 Our next appetizer (I know, we’re all about the appetizers) was an old favorite. 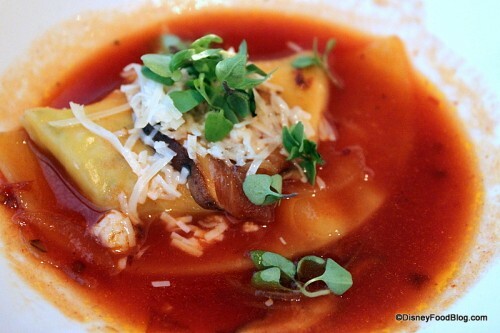 It’s become tradition that we split the goat cheese ravioli at California Grill, and the server is always kind enough to serve the two halves in separate dishes for us! That means we both get to maximize our sauce portion! 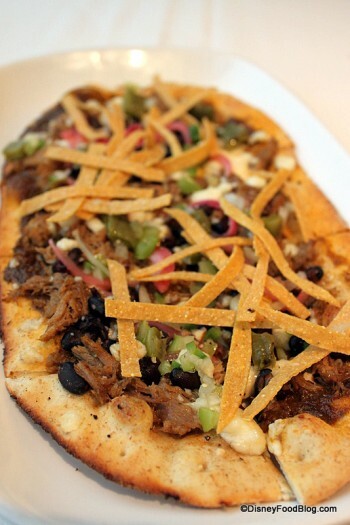 This app has been on the menu since the restaurant opened, and it continues to be a guest favorite. 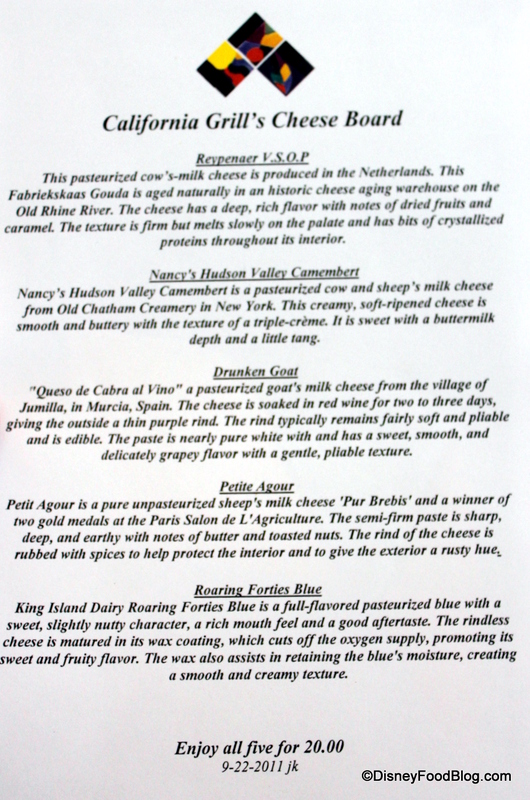 Not to worry if you aren’t a fan of harshly-flavored goat cheese (e.g. I tend to find that goat cheese often tastes a little “foot-y”). This is very mild and quite delicious. Finally we moved on to entrees! We were already stuffed, but we couldn’t wait to sample our new choices: Seared Bison with Truffled Mac and Cheese; and All Natural Duck, Two Ways. 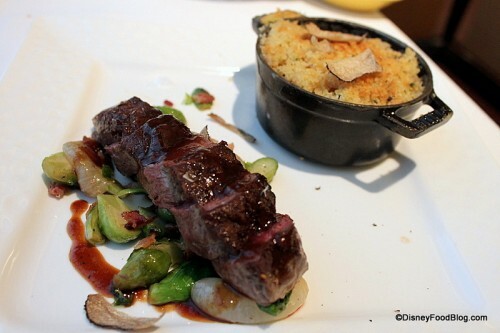 The Bison was served with Brussels sprouts, cippolini (onion), smoked bacon, and Glace de Viande. 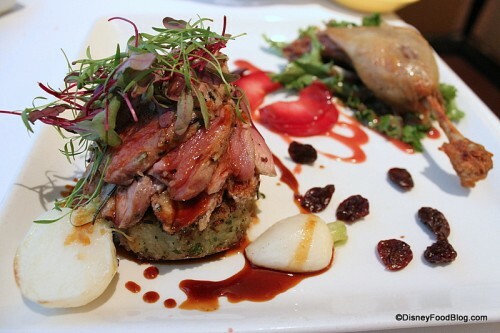 The meat was flavorful and didn’t taste game-y at all. It was perfectly cooked, of course, and well seasoned by the onion, bacon, and glace accompaniments. The side of Truffle Mac and Cheese smelled and tasted amazing. I’d hoped it would be a bit creamier — this was a bit dry — but the flavors permeated the pasta and made for an enjoyable dish. Next up: the Duck! 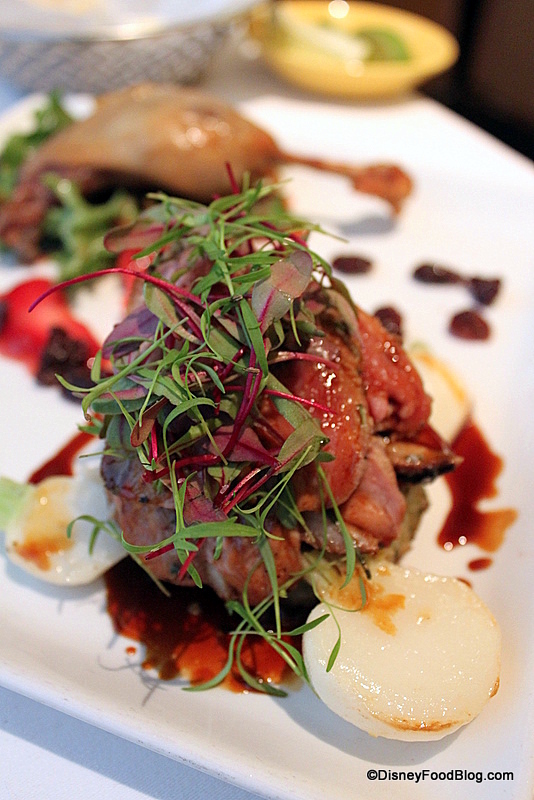 This dish was served with two types of duck: seared breast and confit leg, and was served with potato rosti, cherry demi, and pluot gastrique. I wasn’t that impressed with the sides on this dish, but I could easily have eaten that confit leg every single night of the vacation! It was absolutely amazing, and simply melted in the mouth. 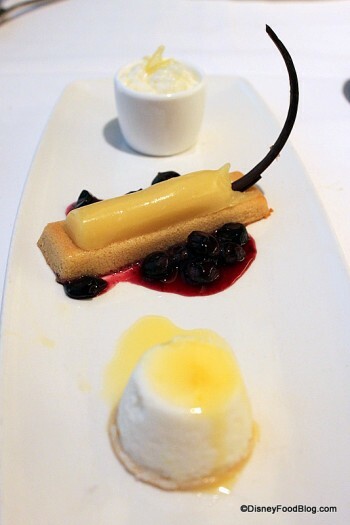 First up, I (as always) chose the lemon dessert trio. Whenever I’m promised Lemon Curd, I’ll bite. 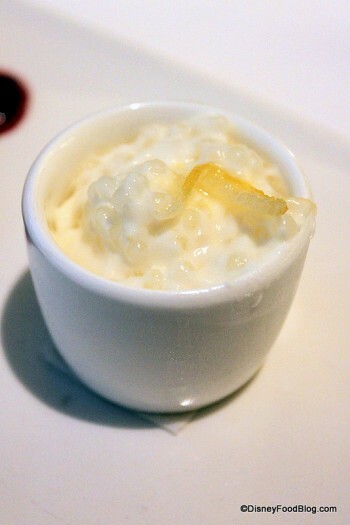 The trio included Lemon Curd with Blueberry Compote, Pudding Cake with Citrus Syrup, and Lemon Infused Tapioca. My most beloved part of the dessert (of any dessert…ever…) was the Lemon Curd with blueberry compote. If I’d gone back to Cali Grill later in the week I would have just ordered a whole plate of this. 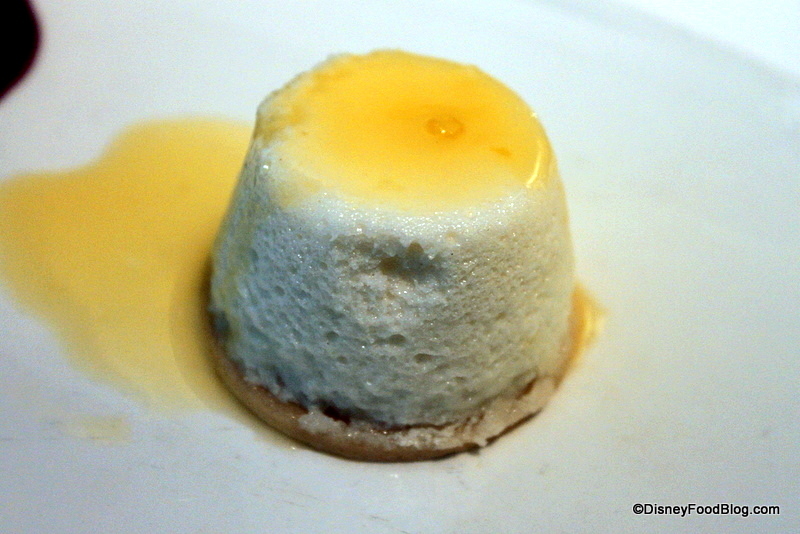 The curd was very tart, but sweet enough to bear — just perfect! 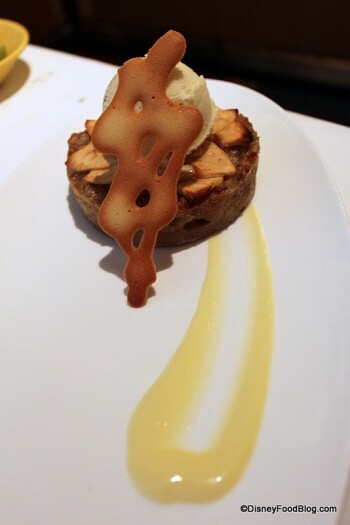 The pudding cake was my least favorite part of the dessert. It was light — almost meringue like — and really didn’t carry much flavor or interesting texture. The second dessert we sampled was the Apple Bread Pudding with Brown Butter Ice Cream (what?! ), Candied Bacon (what?! what?! 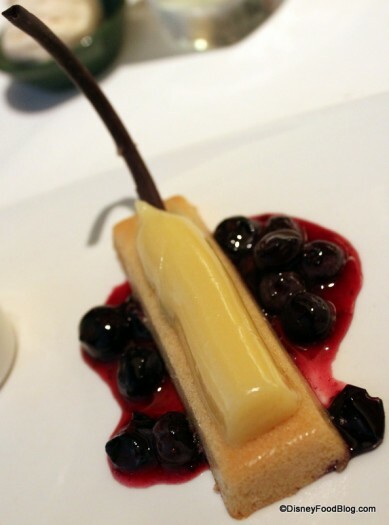 ), and Jack Daniels Anglaise. 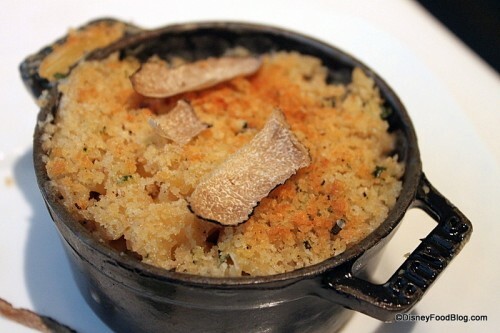 This dish was — believe it or not — a bit disappointing. The apples and pudding were dry, and there wasn’t enough Anglaise to solve the problem. 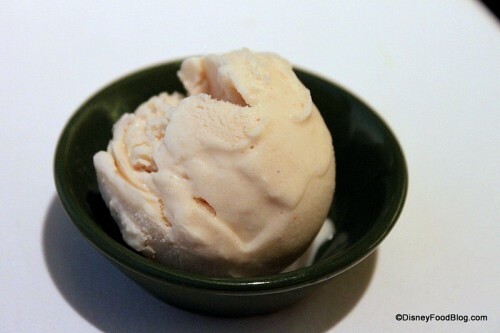 We did enjoy the unique flavor of the brown butter ice cream, but the candied bacon was incorporated into the ice cream and made it a bit difficult to distinguish the tastes. I would have preferred to have the candied bacon sprinkled over the dish. Finally, I couldn’t resist the urge to try the Peanut Butter Gelato that was featured in a different dessert. It sounded too good to pass up! And it was! The peanut butter flavor was strong and bold, and the texture of the ice cream gave the flavor a completely different mouth feel than we’re used to with peanut butter! Such a fun idea. 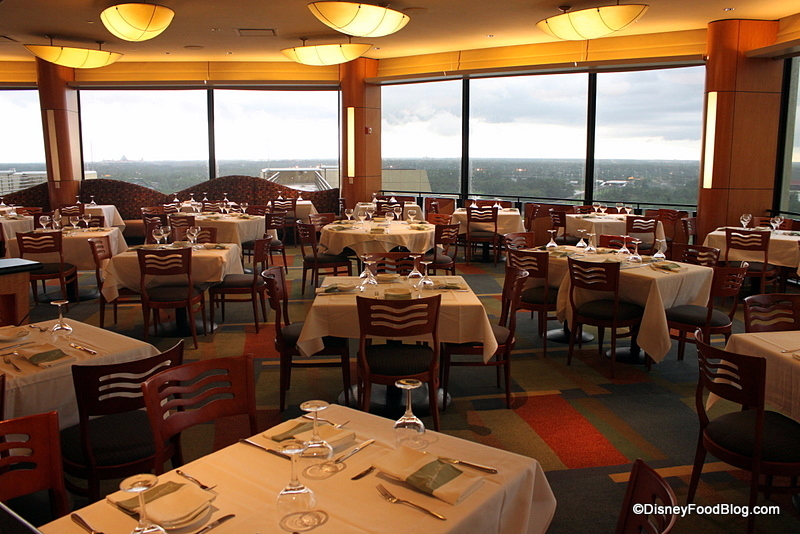 I always recommend California Grill as one of the not-to-miss restaurants in Walt Disney World, because the combination of incredible food and gorgeous views is simply unparalleled. Even though the restaurant has had its ups and downs (and continues to get mixed reviews) I stand by my recommendation. 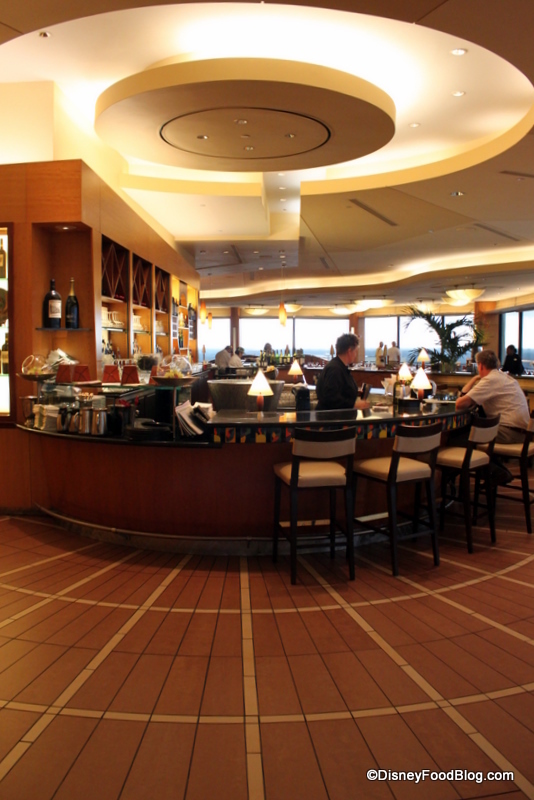 Have you been to California Grill recently, or are you hoping to go? Let us know in the comments section below! Oh AJ! I think I would have given just about anything to be with you during this meal.. it looked heavenly! The one time we ate at Cali Grill I just remember the mashed potatoes (of all things!) being so outrageously amazing! I kept saying “how can they make mashed potatoes THIS good?!? What is in this?!?”. 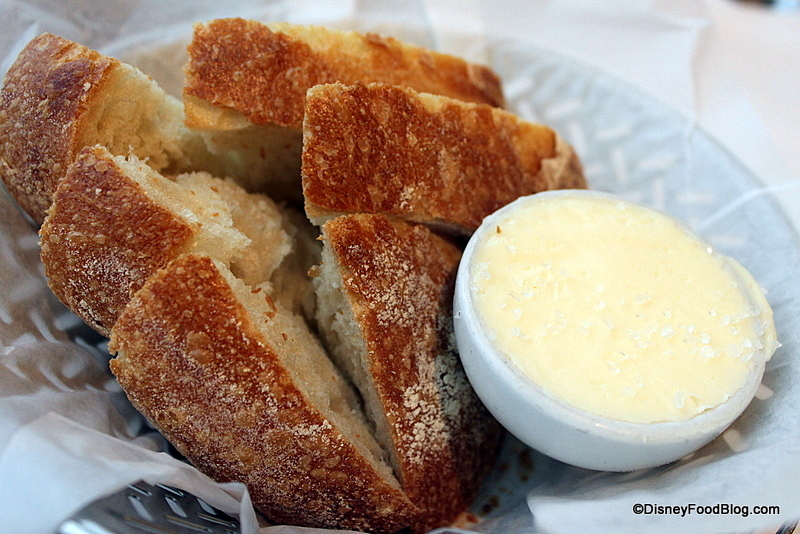 California Grill is my husband’s favorite restaurant at Disney (so far 😉 )and we are thinking of swaping Bistro de Paris for Cali Grill on our upcoming date night. What an amazing meal you had here! Thanks for taking one for the team and going to Cali Grill, lol! 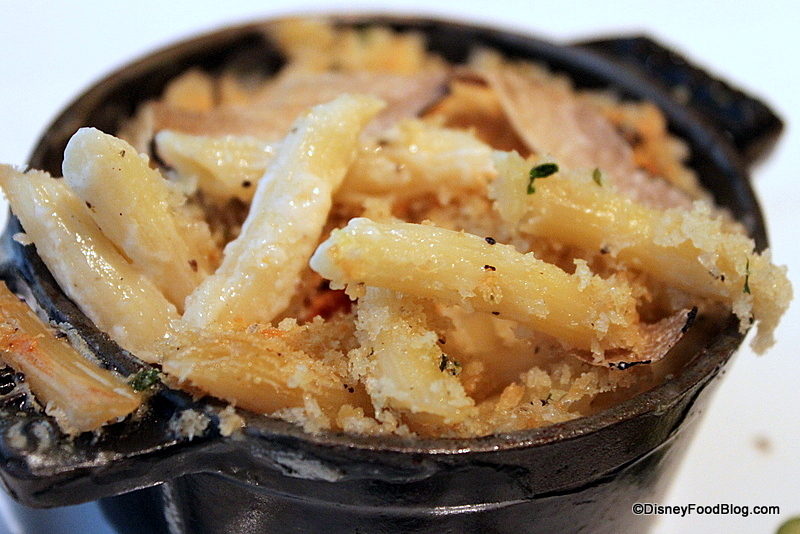 My husband and I dined at California Grill for the first time last year, and it became our favorite meal of all time — not just the food, but the service, the atmosphere, the view, the fireworks, everything! We have reservations for our upcoming trip in February, on Valentine’s Day: how lucky is that? 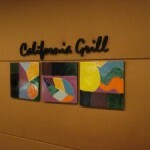 I finally tried California Grill again after a disappointing meal years ago. This time (in September) it was excellent. Our only complaint is that as we were leaving, there were 5 CMs + a manager standing at the elevators and not one of them wished us a good evening. Other than that though, the service and food was excellent! Question: we happened to go on a night that did not have fireworks at the MK (Night of Joy.) My parents have complained that they stop service during the fireworks. Is that still true? I mean, the view is nice and watching fireworks is a plus, but I don’t go to a restaurant to watch, I go to eat. I’d be disappointed if they stopped service for 15+ minutes during the fireworks! This is my favorite restaurant on property hands down !!! Thank you for answering my questions last night on Mama Melrose (I’ll be trying the chicken parm now,) and Cali Grill on WDW Todays Live Show. It was my first time calling and my heart was beating a million times hence the slip ups on the tongue and I couldn’t think. How embarrassing! And my fiance was also being a dear and didn’t know he was listening so after I hung up, he burst into the room laughing. Hopefully next time, my tongue wont get so tied haha. Cali Grill is top of my list to try next trip. Do you think it’s better to go during daylight to make the most of the WDW views or do you prefer it at night for the fireworks? Next to Victoria and Alberts this is my favorite restaurant. We were lucky enough to sit next to the windows during wishes and it was awesome. 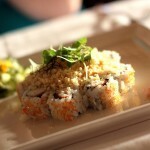 I had the spicy kazan sushi roll and it was the BEST sushi I have ever had and cant wait to have it again in October. This is a restaurant we will have to visit every time we go to the world! Thanks for the review, AJ! We haven’t been to to the Cali Grill in several years, and I’ve heard some mixed things, so it was great to read that it’s still going strong! 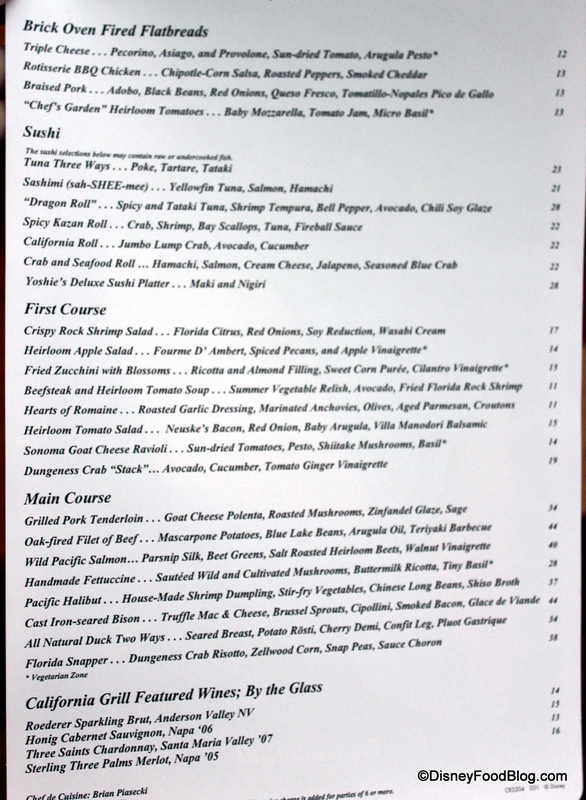 I had amazing tuna sushi there, and one of the best foie gras dishes I’ve ever eaten. I second the advice about eating in the lounge. It seemed a bit more relaxed, i.e., they were very understanding about us lingering to see the fireworks. One thing, though: what’s up with the presentation of that lemon curd? In the pix, it looks like it’s sporting a long black tail. I assume it’s chocolate? An homage to the Mouse? We were in California Grill on oct 1. The evening that there was the special firework of the 40th aniversery of MK. We didn’t know when we booked 180 days before. Our time was 8 pm so it couldn’t be better. It was our first time WDW and also of California Grill and it was a great end of our holliday, before we fly back to the Netherlands the next day. 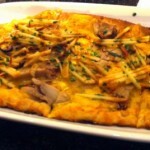 We had the 3 cheese flatbread and it was lovely. I had the Bison as well en that was also very good. 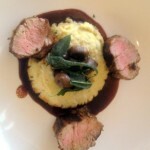 My son had the oaked fired filet of beef and he also liked it very much. Our desert was also the lemon desert trio and I liked it very much. That lemon curd is fantastic. The other desert was the s’mores … chocolate cake with the peanutbutter icecream. I don’t know anymore what my son thinks of that. Before the desert was the firework and we had a fabelous view of it. We recommended this restaurant to everyone that ask us on our Disney forum here in the Netherlands and Belgium. If we come a next time, it will be certainly on our list to go. Our last visit, we went to California Grill for our anniversary dinner and it was perhaps the best dinner we have had anywhere on property. It has earned top spot on our ‘must visit’ list. On the upside, it looks like the entrees have picked up a bit–they were becoming a little routine for awhile. For dessert I have almost always been a little disappointed when I failed to order the chocolate lava cake…not that the other desserts are poor, but the lava cake is really excellent, particularly when the seasonal ice cream is a good pairing. 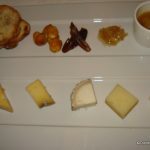 I had a wonderful solo meal at CG on my July trip to the World. I was seated at about 8pm at a table with a wonderful view of MK. I ordered the soup, a ravioli and the current lamb flatbread. I had an absolutely wonderful meal, my server, Jason, was at the table very frequently and actually sat down and had a conversation with me about working for the Mouse after he found out that I worked as a bartender for Marriott. I cannot stress enough that this is a must do meal. I didn’t get up and watch the fireworks from the balcony because I had a wonderful view from my table. Eating in the lounge is a great option as well–there are several tables that have fireworks views. have I said how much I love the lounge? The lounge servers are always awesome. My review is far more negative – I feel a little ‘unsporting’ to leave it. I found the whole CGrill experience to be disappointing. And very expensive. It was my wife and my 20-year going out anniversary which I thought deserved a celebration. We booked this place after much research. I should say the food was excellent but the whole ambience was poor. We go to check in downstairs and are told that it will be a 20 minute wait. No problem at all as we wanted a drink at the bar. But, we were held in a queue as everyone else complained about the wait. We then go up in the lift and get to the bar. It’s busy but not rammed and we sit at our table for a few minutes with no service. There are plenty of people sat round with no drinks just waiting for their dining table. Now, I know that many of you lovely Americans don’t share our British and Irish tastes when it comes to alcohol (and volume therein) but I wanted a drink! So, I go to the bar and order a decentish bottle of wine. Not the most expensive by any stretch but not the cheapest either. The guy says nothing to me, doesn’t offer me the opportunity to taste the wine or pour it for me or anything. Thanks, I say, can you please add it to my bill. No chance, he says. He likes it to be settled there. This is obviously to get a tip which annoys me. Still, I’m not going to be the atypical Brit who doesn’t tip so I pay and tip and carry it back to my table. The wine is superb. We get called to our table and it’s nice and bright and airy but very noisy. With loads of kids everywhere. I get that Disney is a family resort and not every couple has grandparents in tow who can babysit but it still annoys me that the Dining Plan now means that every top-end place is still packed out with kids. It’s so busy it reminds me of a motorway service station. A very posh one but still very, very busy and hectic. I must sound very miserable posting this review but we found the whole experience below par. 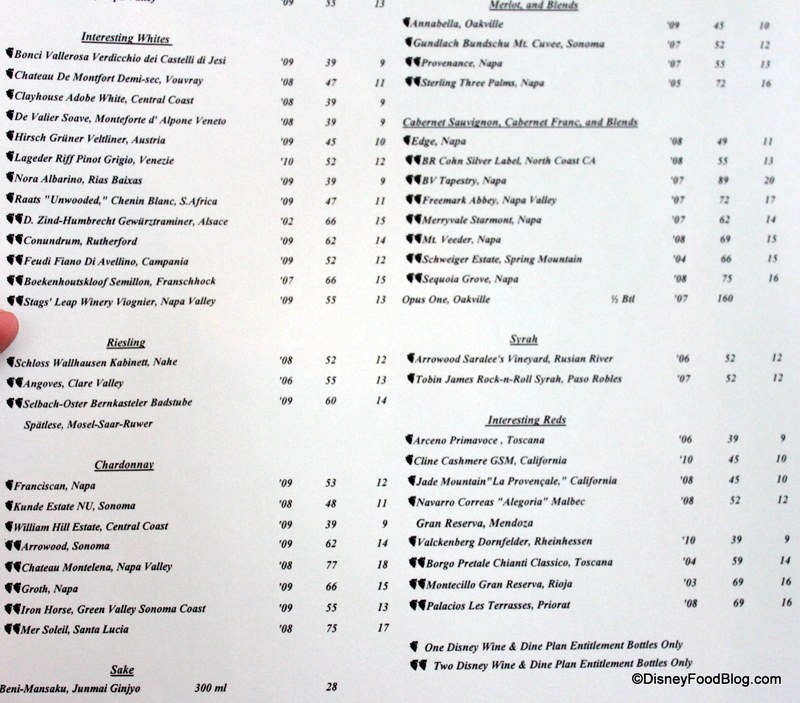 The first day of our March visit, I booked the coveted reservation at the California Grill during the fireworks show. We started both started with a sushi appetizer. One of them had fish roe on top of it, which I had never tasted before. It was delicious! It tasted fresh, like summer and sea mixed together. I had a seafood paella and my partner had the bison. It was prepared perfectly. Even though we were on the deluxe dining plan and were both entitled to a dessert, the meal was so filling, we ended up splitting a chocolate truffle dessert of some sort with an espresso. It was a vacation for our taste buds! I will be returning to Disney in August for my 40th birthday, and I have my reservation already placed at The California Grill. 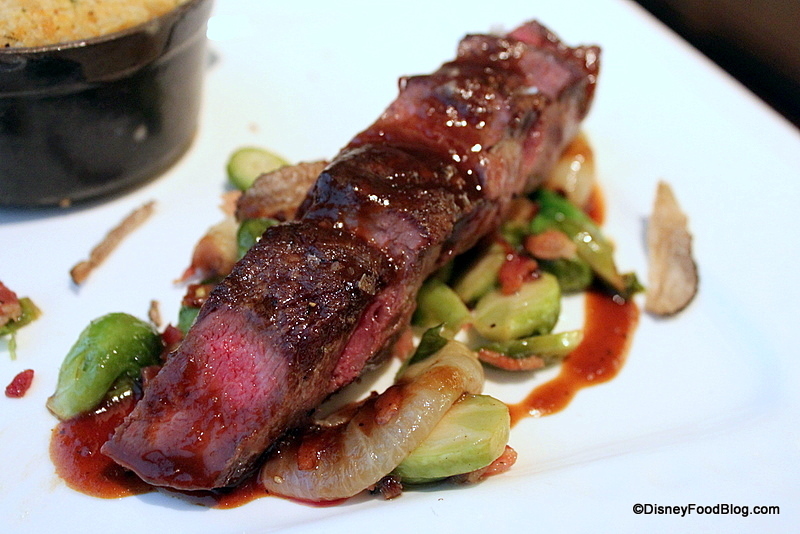 We ate at some other fabulous places while in Disney, but hands down, we loved The Grill the best! 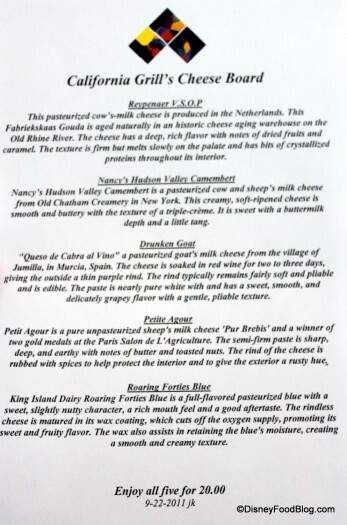 Just found this review linked from the cheese plate one. I was at CG a few weeks after and had the duck too- the confit was heavenly! I’d eat that every night of the week too! 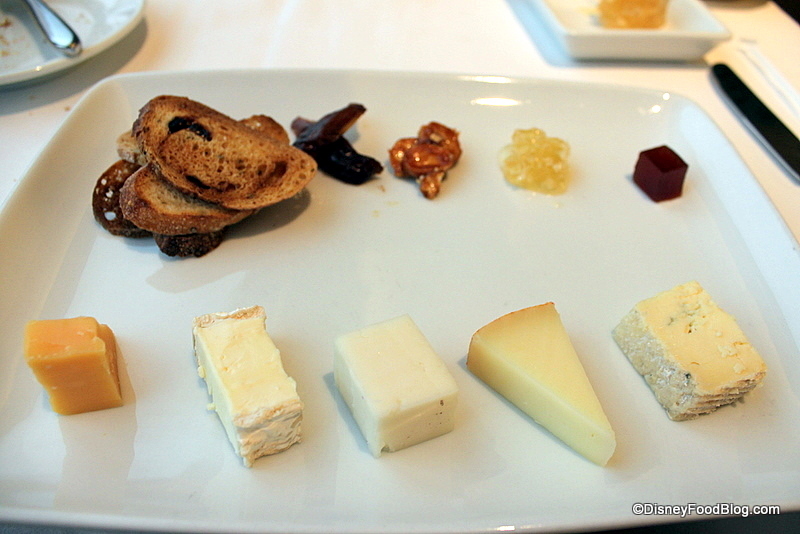 I agree that the food at the California grill is top notch, but the portions on the cheese board are so small it makes it hard to share. Over the years we’ve gone to this restaurant less and less, mainly because it’s become very noisy and crowded, and the signature dining dress code is not enforced. But I’m glad you had a pleasant meal there and hope that it is returning to it’s former glory!